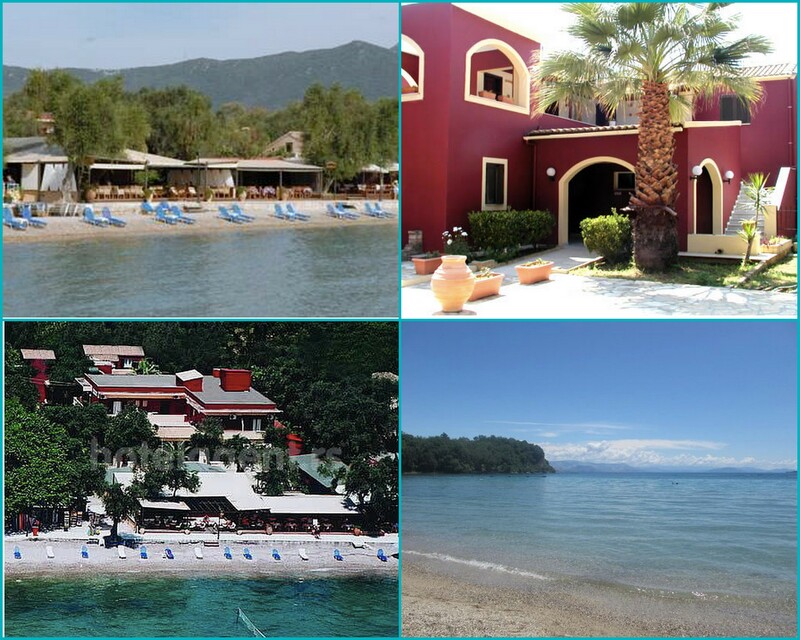 This holiday in Corfu’ will inspire you to reconnect with the power of the Elements and the Bliss of Nature as we spend one week practicing Yoga outdoor and living by the beach. The day flows as morning long Yoga practice, then brunch followed by time on the beach or optional excursions to other beaches, to sacred sites, Temple of Artemis and Corfu’ town. Arrival, Orientation, Evening Welcome Dinner. Daily 3 and 1/2 hrs of Solar and Lunar Vinyasa Flow Yoga session on a beachfront terrace ( weather permitting) ( includes Asana, Pranayama, Mudras, Bandhas, Kriyas, Mantras. Dinner on the first and last night included. 26th May: short Yoga practice/meditation if time allows , breakfast Departure. Prices range from garden view £700 to £790 ( double – Single occupancy ) to sea view £ 750 – £850 (double and single rooms all with private bathroom) – early booking recommended as limited number of sea view rooms). To reserve your place a deposit of £ 250/300 ( depending on the room chosen) will be required at time of booking. Full payment required by the end of March 2019 done via Bank Transfer. Accommodation in a double shared room with private bathroom, light breakfast everyday, 6 brunch and 2 dinners (7 nights / 6 days ) . Supplement for single room available. 3 and 1/2 to 4 hrs Daily Yoga tuition, includes sunrise and sunset meditation and walks. All travelling expenses, insurance, the other meals. Wine or other beverages. Once the booking is made there is an administrative fee of £100 in case of Cancellation before the 1st April. Between the 1st and 15Th April cancellation fee is 25% of the total. Between the 15th April and the 30th April the cancellation is 50% of the total. Full price if no show. Fifth Edition of Aditya Yoga School at the Om Yoga Show at Alexandra Palace London. YOU can find me and the school Alumni at Stand E17. I will teach two free classes on Saturday and Sunday and a Workshop to support YogaGivesBack, see below for details. 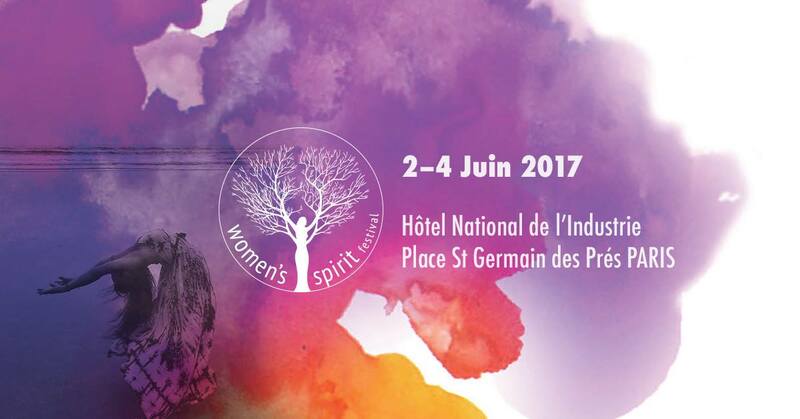 Celebrate Shakti Yoga, Music and meditation on the weekend of the 2,3 ,4 th June in Paris at the first edition of the Women Spirit Festival organised by Charlotte ST Jean, founder of Yoga Chez-moi and Elodie Garamond , funder of the Yoga Studio “Le Tigre”. With Charlotte St Jean, Alessandra Pecorella and Jessica Magnin. I will be beck in Chamonix this Summer to teach Vinyasa at the third edition of the Chamonix Yoga Festival. You can find all the information on classes at Chamonix-Yoga-Festival page. 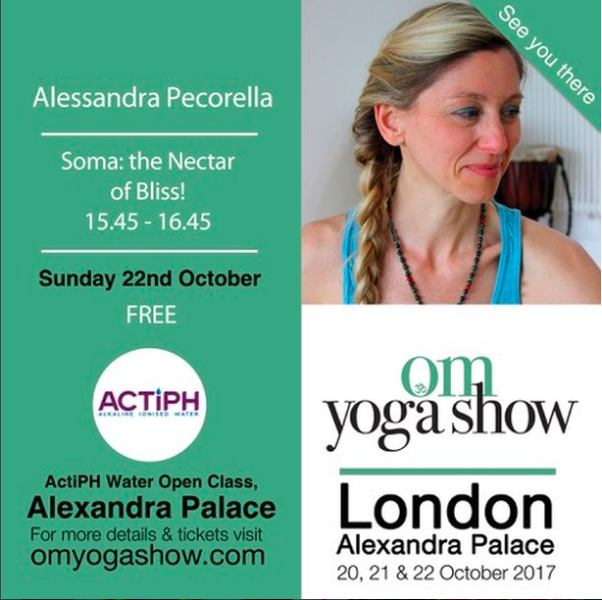 Aditya Yoga School weill be Exhibiting and presenting at the next Yoga Show at Alexandra Palace London. You will find the school at Stand H3. Description: Savour the fluidity of Moon Salutations and liquid sequences of asanas. This Vinyasa class weaves intelligence and creativity to integrate the healing energy of the Moon. Description: Rhythmic classical and creative Solar Namaskars and energetic sequences ( expect core, twists, arm balances and inversions) aimed to invigorate and purify body and mind and playfully challenging. 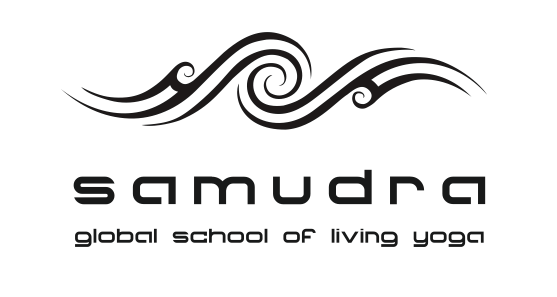 I will be teaching two Master classes at the second edition of the Chamonix Yoga Festival this Summer. The schedule is not online yet but please do check the line up of incredibly talented international Yoga Teachers available to you to study with during this inspiring weekend in the beautiful Chamonix-Mont-Blanc. Grab yourself a ticket and an early plane ticket to Geneve and come along for a great weekend of Yoga, music and more! Blanche , the organiser, has also managed to partner up with great hotels for very affordable prices. 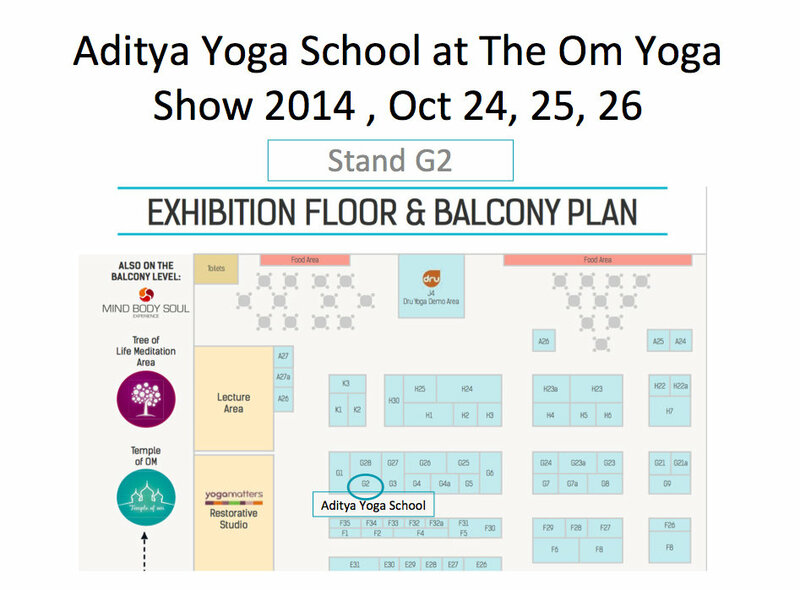 Aditya Yoga School will be exhibiting again at The Om Yoga Show this year in London. I will be offering two free classes in the dedicated areas Santa Monica Sunset and Warrior . The second edition of The Yoga Festival Val D’Isere is in the making! Come and spend three days in yoga bliss, the total Yoga experience under one roof. The ninth annual Yoga Show will once again be held in the prestigious National Hall, Olympia. There is plenty to do at this year’s show including free yoga & pilates classes, Yoga Teaching Conference, Teacher Training taster sessions, children’s yoga, demonstrations and lectures. Sample a wide range of yoga and pilates. Open sessions are for all levels of experience including beginners, and are the ideal way to try something new. Sessions are held with some of the country’s leading teachers and professional organisations. 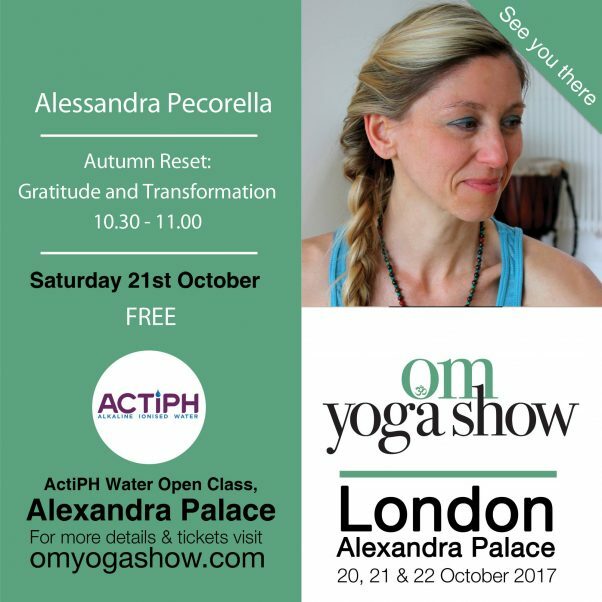 I will be teaching an Open Class at The Yoga Show on Sunday 27th October from 10.45 to 11.15 am . PLease check the Program for more info. Radiantly alive: Creative vinyasa flow to detox and strenghten the spine. Spiral, twist and free the spine! In yoga we call the spine Merudanda that literally means the Central axis of the body. At a more subtle level the Spinal Column is the phisycal highway for prana-shakti ( energy lying dormant at the base) and the counterpart of the main energetic channel of the body: Sushumna Nadi. It is the house of the Central Nervous System that acts as the internet of the physical body keeping all the parts connected and informed at the speed of light. A healthy and flexible spine will not only reflect in a healtier physical body but also in a sharper mind that is capable of experiencing higher levels of perception. When Sushumna is awakend you feel radiantly alive! 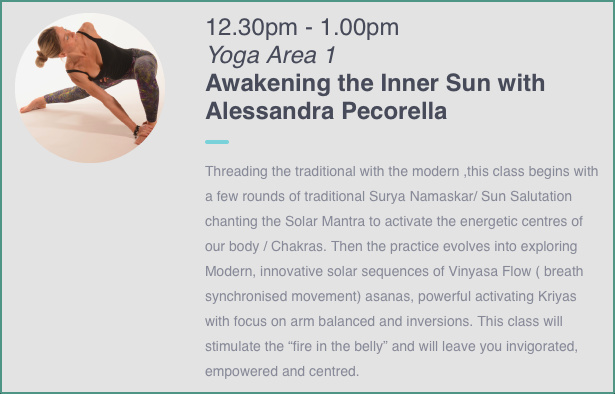 Deepen your connection with Agni Fire in this two hrs Energetic Flow Yoga workshops where we aim at boosting our prana, energy and optimism , joy and positivity. The practice of yoga asanas sustained by deep rhythmic breathing, focussed intention and beautiful music creates the perfect landscape to tend the inner fire of digestion, passion and devotion. We will work with a series of cleansing detoxifying techniques ( fire kriyas ) to burn all impurities that create a sense of lethargy and inertia.We will then move towards the ignition of the fire of passion in the Solar Plexus area. That is such an important part of our Sadhana Practice as, in the long run, we will only be capable of sustainying what we really love. Finally we will work towards the innermost fire, the flame of devotion, that is the attitude that keeps us connected with our true intention and true Self.